The night before my younger son was born (as seen on the left above), I weighed more than I ever want to weigh again. And losing that weight was a lot harder than with baby number one. That came as a shock, accompanied with a good deal of worry over whether I would be able to keep the weight off – if it ever came off at all. I have one of those lovely body types that gains weight if I so much as look at a cupcake. I’ve tried various exercise routines over the years, and finally found success with a combination of P90X and a couple interval routines, which have helped me achieve a level of fitness I never expected. The problem is, however, that exercise is only part of the solution. Living under the impression that I could work off the pizza and doughnuts and Saturday morning fast food breakfasts only lasted so long—just long enough for me to start regaining my baby weight (but this time without the baby). When my clothes became uncomfortably tight, my options were to give in and buy larger ones or revolt against what I’d done to myself and take action. I took action. Before actually doing something, the shift came from within. I know that sounds metaphysical and whatnot, but it’s absolutely true. There is a huge difference between thinking, Hmm, I really could lose a few pounds and realizing, Something has to change, and I’ll do whatever it takes to make it happen—permanently. Follow-through is a must, but there has to be that driving decision first. 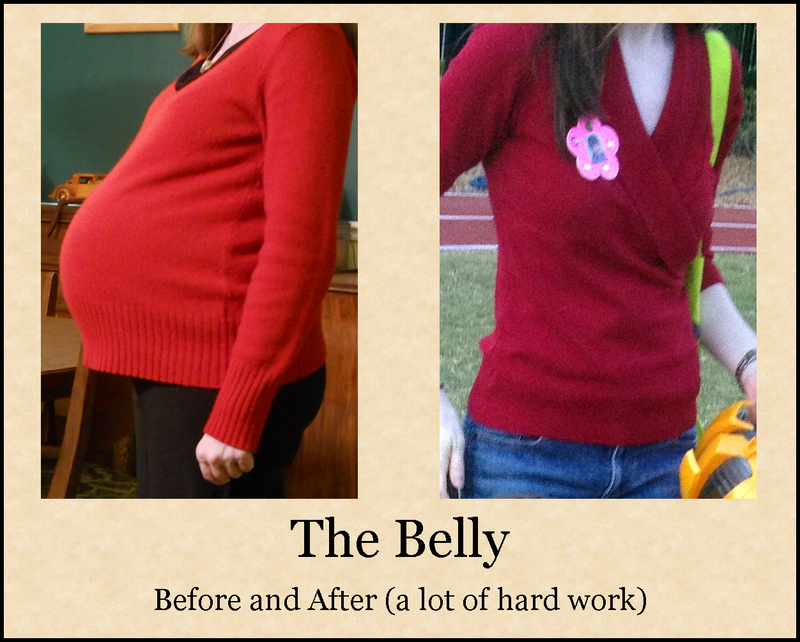 I heard about Wheat Belly: Lose the Wheat, Lose the Weight, and Find Your Path Back To Health a year or so before I decided it might be worth looking into. I didn’t want to cut out wheat. It seems to be in everything, including many of my favorite foods, but I was desperate and hoped it would make a difference. My husband thought author William Davis, M.D. was a quack, but since I was the one buying groceries and cooking, he had little choice but to eat my wheat-free food, at least at home. He lost nine pounds. I’ve been reluctant to discuss this decision because most people think I’m stupid, latching onto a fad. I mean, why deny myself “regular” food if I don’t have an allergy that prevents me from eating it? At the same time, however, I was pleased by a number of people who came out of the woodwork and told me how going wheat-free has changed their lives for the better. As a friend said, even if only one-quarter of the book is true, that tiny bit of information is worth heeding. Today’s wheat has been genetically engineered to grow more plentifully, and in doing so, its gluten content has risen dramatically. Franken-wheat, some call it. What struck me most about Davis’s research was the number of conditions apart from celiac that are affected by wheat consumption. Many of Davis’s patients had problems that no other doctors could fix, yet the simple deletion of wheat from their diets solved them. And then there’s the obesity issue. Although whole wheat is recommended as a fiber-rich staple that should be a part of everyone’s diet, whole wheat bread elevates blood sugars nearly as high as white bread (don’t believe me—believe Harvard Medical School). While this is particularly harmful to you if you’re diabetic, this even affects people like me. The two slices of whole wheat toast that I used to eat every morning caused a blood sugar crash that made me ravenous two hours later. The Paleo Diet has a lot in common with Wheat Belly, although there are places where the two diverge. If you follow the “primal” version, you can have dairy, while many Paleo followers shun milk products altogether. Either way, the main idea is that humans started as hunter-gatherers, and we survived just fine without processed foods. 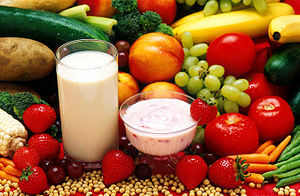 Paleo depends on many natural foods, but carby foods like corn and legumes are a big no-no. There are a number of great Paleo recipes that I’ve tried, but I have not gone completely Paleo. Instead, I use a blend of the two diets I’ve discussed, as well as some gluten-free selections. Even so, the mere deletion and substitution of certain elements of my diet isn’t enough, which leads to the third and most drastic thing I’ve done. Making my own what? Well, a lot of things. Pizza dough, protein bars, almond milk, almond meal, coconut milk, coconut flour, peanut butter, tomato sauce. When I cut out wheat, I knew we couldn’t eat out as much, so that meant cooking. By making a lot of things from scratch, I not only keep the cost down, but I also control what my family eats. The pre-made items that I do buy go through a lot of scrutiny first. If I don’t know some of the chemical-sounding ingredients, or if sugar is toward the top of the list, I make it on my own. I also avoid buying canned or frozen food as much as possible. In short, I’ve become one of “those” moms. I started to take an interest in natural remedies while doing research for a character in one of my novels. (It always comes back to writing for me, doesn’t it?) Many people never think twice about popping a pill to fix their problems, but I would rather live in a way that keeps me from having problems to begin with. And if I need medical help, I would rather use nature’s treatments first. I never even knew coconut oil existed before I read Wheat Belly. I assumed that I would have to buy it at a specialty store and was surprised to find it everywhere I normally shop. While I knew that hydrogenated oils are bad, I didn’t realize how bad. A friend gave me the book The Coconut Oil Miracle , by Bruce Fife, C.N., N.D. This truly is a miraculous oil. Not only is it a natural antibiotic, but it’s also antiviral and can even help fight the flu. So what does coconut oil have to do with weight loss? It gives us energy and increases our metabolism. This is wonderful for people like me. I have to exercise two to three times more than people with fast metabolisms just to keep from gaining (and that’s only if I eat right, too). To Make a Long Post a Little Longer. . .
What I discovered, even before I lost any weight, was that I was transformed, and not just physically. Although changing my eating habits certainly keeps me satisfied longer, the way I think about food (it’s not a social or even a comfort activity for me anymore) underwent an even more powerful transformation. The weight loss is great, but the health benefits that I will reap from my change of lifestyle will last me, I hope, much longer than the clothes that I can fit into again. I have struggled with weight my whole life, even if I appear to be in great shape now. I almost wish sometimes that I let myself put on a ton of weight before getting into shape to prove that I do have to struggle. It gets old listening to people say how nice it must be to have it so easy. I look the way I do because of choices that I make every day, and things could be very different, if not for an embarrassing trip to the pediatrician when I was ten or eleven. Instead of gently telling me that I needed to lose a few pounds, my doctor pinched my far-from-flat belly in one hand, jiggled it, and with an expression that said Do this or die, told me I needed to take care of that. I was mortified. I knew that everyone on my dad’s side of the family struggled with obesity, and my dad had warned me on more than one occasion that if I entered adulthood overweight, it would be hard to take and keep the weight off. But I wasn’t worried—I was nowhere near adulthood, right? That doctor’s visit was the first time I felt degraded enough to do something about my body. If I were to be reincarnated based on my metabolism alone, I would come back as a sloth. So for me it doesn’t come down to just diet or exercise but both. Over the years, I’ve discovered the tricks that do and don’t work for me. For instance, those cute little ten minute workouts don’t work. They simply don’t burn the amount of calories that I need to maintain weight, much less lose. So when I come across something that works, I add it to my routine. The jump rope was the first tool that really helped me shed pounds, and I’ve used it regularly since my senior year in high school. Then in college I started drinking meal shakes, more out of convenience than anything else. I’ve drunk them ever since, from Kashi to Slim Fast, and now ViSalus. People have teased me about them, but if I didn’t drink them, it would be so much harder to maintain my weight. I added P90X in 2009, and I love it. I supplement with the jump rope, a recumbent bike, and some circuit training to keep my muscles challenged. Someone told me once that I was crazy for trying an extreme workout. And I have no delusions of being on the next cover of the Sports Illustrated swimsuit edition—I’m still going to have knot-knees, no matter how fit I am—but with P90X, I did achieve the best fitness of my adult life. Never before could I do a real, unassisted pull up, but P90X helped me build up enough strength to finally do what I thought was impossible. With P90X, I became a stickler for logging my food intake, something I only did sporadically before. Whenever I don’t do it, I gain weight because I don’t feel accountable. I finally found an app called SlimKicker that not only counts calories, but it also keeps a log of my weight and exercise, and it has fitness, diet, and lifestyle challenges that keep me on my toes. I’ve organized my life to make sure that fitness is a priority (one of many). It takes discipline and sacrifice, but I hope to be a good example to my children. More importantly, I hope to be healthy enough to see them into adulthood. Searching the fitness section of Chamblin Bookmine (the most awesome bookstore in northeast Florida, by the way), author Edward Jackowski’s title practically jumped out and grabbed me. I knew I had to be doing something wrong to work out so often and have absolutely no results. And when I read the book, I discovered that there were many people in the same situation. The reason is that there are many fitness programs out there, but they are often directed at anyone and everyone instead of targeting the appropriate body types. Jackowski lists four body types, according to where one puts on weight. Cones are broader of shoulder and narrower at the hips, putting more weight and muscle on the upper halves of their bodies (usually men but not always). Rulers gain weight evenly from top to bottom, with small to medium hips. Spoons are the opposites of cones, amassing weight on the lower halves of their bodies, particularly thighs. And finally, hourglasses (most often women) are proportional on top and bottom, usually with slender waists. Body types are genetic, so there’s no way to change that. Jackowski, however, details plans for each type, listing which exercises to avoid (because they accentuate the negative aspects of those particular body types) and which to add to a person’s routine to become as fit as possible. I found out, since I was a spoon, Lou-Ferrigno-style weightlifting and step aerobics were the two last things that I should have done. As soon as I adopted Jackowski’s workout, I became physically fit within a few short months. The most gratifying part was running into friends several months after losing weight, and they looked at me and asked where “the rest of me” was, since there wasn’t as much of me as there had been before. There are many things I love about Jackowski’s workout. First, he explains why we need to do certain things, like a warm up and stretches and why they need to go in a particular order. And the exercises he recommends don’t require any special or expensive equipment. If I don’t have time to do a full workout, I can pick and choose exercises and tailor the whole thing to my limited schedule. Since 2009, I have also added the spoon-appropriate exercises from P90X and Spartacus. The central component to the You’re Exercising Wrong workout, which is challenging for many people, is jump rope. According to Jackowski, “you burn more fat with rope jumping than with any other exercise” (81). I try to jump rope two to three times a week, and at one point between babies, I could do so continuously for ten minutes. It sounded impossible at first, but I built up gradually from 30 seconds to one minute on up. If an average girl who barely participated in team sports can do it, anyone with two functional legs can. 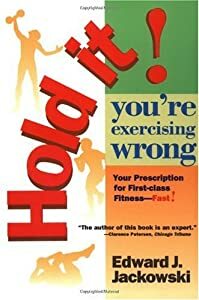 Even if you’re skeptical about the jump rope part, I highly recommend this book if you want to get into shape and learn more about your own body type.